Upgrade your interior with the Ascot Dining Chair Beige Velvet, a stunning model that will be the envy of all your guests. Regal and refined, the combination of tradition and modern opulence undoubtedly cements the Ascot's remarkable reputation. A sumptuous statement piece, the beige crushed velvet seat will shimmer softly in the light, and has a full webbed seat pad for first-class comfort. Inviting you to dine in luxury, the high backrest flaunts a swish quilted design with buttons for an armchair-like appeal, subtly encircling the body for additional support. 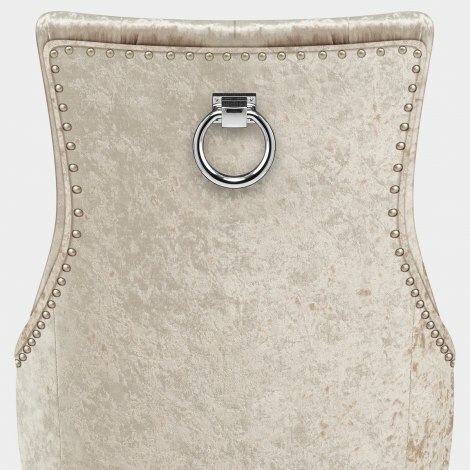 Not only is it edged with decorative studs, but the tasteful chrome ring on the rear delivers a lavish touch too. Fashioned from a solid wooden frame, the four stable legs are coated in an opulent dark wenge finish, producing a striking contrast against the light shade of the upholstery. Protective floor plugs on the underside of the feet are a functional finishing touch. "The look will add to any dining room a charm"
The Ascot Dining Chair Beige Velvet is a well made product and the look will add to any dining room a charm. We have bought 6 of this chair and have received compliments from a lots of friends. The delivery was done on time and on the next day. 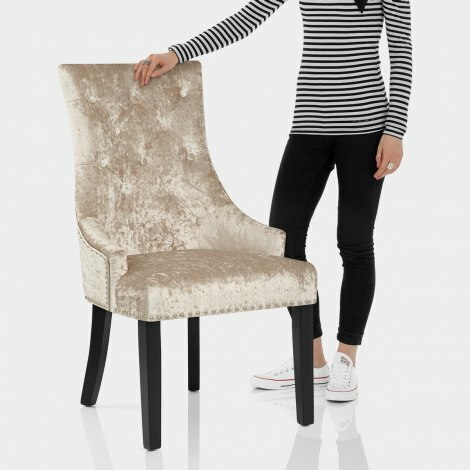 We highly recommend these chair form Atlantic shopping. Just received the chair I ordered excellent delivery and beautiful chair easy to assemble. Will definitely shop again. Love this chair, brought it to match our sofa and armchairs, perfect match . Very comfortable. Super quick delivery. Makes a good bedroom chair. We wanted a small bedroom chair just to fill a corner. This was a good price, and works perfectly.